The resort is spaciously set up on a 3.5 acres private peninsula stretching into Lake Mutanda. The thirteen cottages are built on a wooden platform, each with private veranda and en-suite bathroom. We offer single, double/ twin and triple rooms with comfortable beds and mosquito nets. Mutanda Lake Resort is spectacularly located on a private peninsula stretching into Lake Mutanda. 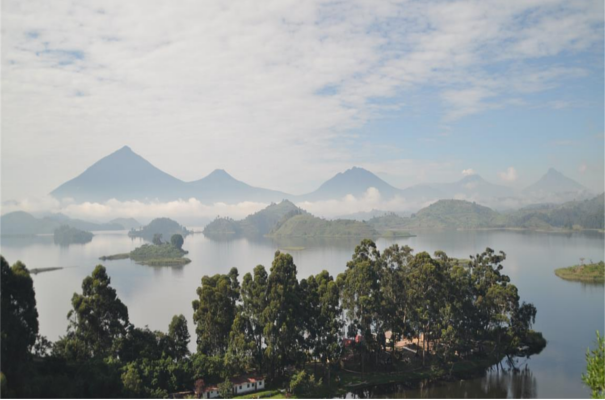 With small islands dotting the surrounding lake and a backdrop of misty volcanoes in nearby Rwanda and DR Congo, this setting never fails to impress visitors. The main building where the restaurant is located resembles a Swiss chalet with an African touch- the perfect place to enjoy a sun downer on the veranda watching otters visiting the shore, or to cuddle up next to the fire place.